Here’s a tip for any would-be bloggers out there: never say you’re going to blog about something "coming up next." You’re just setting yourself up for serious trouble when Murphy strikes you with a serious case of writer’s block. It’s been a month since I put in that darn scrolling marquee, proclaiming the soon-to-be posted memoir of our visit to Scott’s Seafood. I thought it would motivate me to keep up with the regular posting. Instead it has been mocking me the whole time. "C’mon already! What, can’t even put two sentences together? Neener neener neener!" Bleah. I’ve gotta get over this funk. And the only way to do it is just get posting again. So, I’m going to put the Scott’s Seafood post on the back burner and pull something up to the front burner. A post that has been waiting just as long as the Scott’s Seafood post to see the light of day, but at least hasn’t been thumbing its nose and blowing raspberries at me. 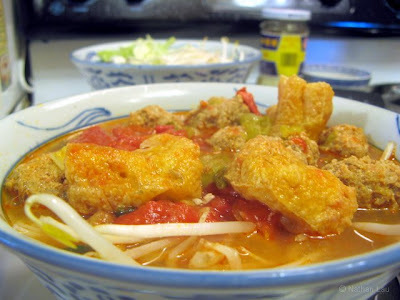 Bun rieu cua is a Vietnamese soup noodle dish that has a tomato and tamarind flavored broth with meatballs made from ground pork, crab meat and shrimp meat. This dish was taught to Annie by my sister, who got the recipe from her Vietnamese mother-in-law. It has become our favorite Vietnamese soup noodle dish to make at home, made more often then pho. *If you want the meatballs to be even more amazing, you can add a can of lump crabmeat to the mix. Take the reserved shrimp shells and put them in a pot, then cover with water and bring to a simmer. Strain out the broth into a large stock pot. To the stock pot, add the can of chicken broth , water, and tomatoes, and bring to a simmer. Form the meatball mixture into dumplings with a spoon and drop them into the stock. When they are cooked through, remove from the stock. Throw in green onions at the end. Add ketchup and tamarind soup base mix according to your taste and color preference. 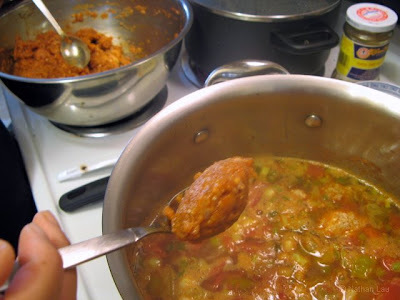 Cut up the aburaage into bite-size pieces and and warm those up in the stock after the meatballs have been removed. In another pot, boil some water and cook the rice stick noodles according to the instructions. Drain and set aside. Rinse the bean sprouts and shiso leaves and set aside. Finely shred the cabbage. To assemble soup bowl, start with the noodles, then add some sprouts, shiso and cabbage. Ladle in some of the boiling hot soup until the veggies are covered, then pour the soup back into the pot. This will warm and wilt the veggies slightly. Refill the bowl with soup and top with meatballs and aburaage. For an added, pungent kick, serve with a teaspoon of harm ha (Chinese salted shrimp paste). For me, this is one of those perfect dishes that has all the flavors. The sweetness of the shrimp and crab, the saltiness of the harm ha, the sourness from the tamarind, the slight bitterness of the raw cabbage, and the umami of the tomato. The meatballs are heavy while the aburaage are light. The noodles are slippery, the bean sprouts are crunchy, and the shiso is…shiso-y. Well, I hope this bun reiu cua recipe is worth the wait. One of these days, I may get to the Scott’s Seafood post…but no promises! >ohohohohoh! I LOOOOVE this soup! Thank you so much for the recipe – I’ve been looking for this exact recipe. None of the V restaurants in town serve Bun Rieu. big hug cuz you ROCK! thanks for your comments! Have fun making it yourself. >I love Bun Rieu because it’s close to the taste of Penang hawker food. I always order this at Vietnamese restaurants. Thanks for sharing the recipe. Looks great. >You Rock! This looks tasty, I am heading to Chinatown after work to grab ingredients! >I’m gonna try your recipe. I love adding the shrimp paste to my soup, and everyone else I know thinks it’s weird. 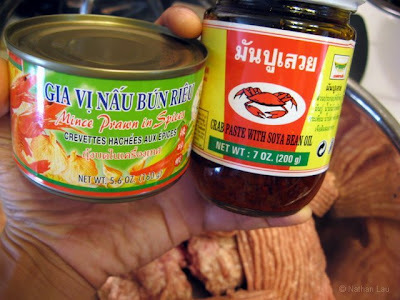 >@Nobuta – shrimp paste is awesome. Please let us know how it turns out for you! and well just moments ago I found your site. My mother has been bugging me for the past 30 minutes and I've been seaching all over the place for this recipe. AND YAY FOR THIS SITE! YOU'VE SAVED ME! She will be cooking this later on. And using your recipe thanks to you! >That's what my friend had at a Vietnamese place. Thanks for the recipe! 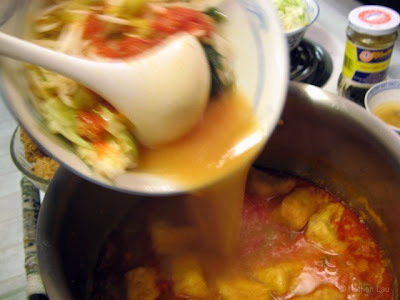 Are you familiar with Canh Chua Chay (sweet and sour soup with tofu and vegetables)? 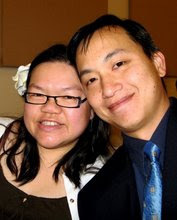 >Nancy and Momgateway – if you do make this, I'd sure love to see / hear about your results! I tried your chicken pho and it came out very good. This meat ball soup looks so good. I am glad to get this original recipe. I will have to figure out what tamarind soup mix is at the market. Find a day to buy all the ingredients and make it. I do not like ham ha, though. I imagine the meatballs taste better after a day or two. Good luck! Let us know how it turns out for you. 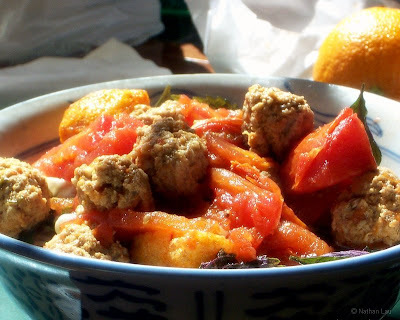 We haven’t done bun rieu in so long, it may be time to make some again. I made this dish today. It’s a little bit fishy for me. By the time I had the second helping, I grew used to it more. The shiso definitely helped. I cooked one meatball as you suggested and decided to add another egg to the meat mixture so it would not fall apart. I asked the butcher to ground the ground pork two more times. I used a mini chopper to mince the shrimp after I cut them into smaller pieces. I do not have a food processor and do not know if all these factors contributed to the fact that some meatballs fell apart in the stock pot. I made them smaller and that helps. It is hard to tell when the meatball is done but not overcooked. I guess experience count. Overall, I like this dish. Thanks. SWIFT Theme by Satish Gandham. 68 queries in 1.388 seconds.